The building that now constitutes the Sofitel Paris Arc de Triomphe was originally the creation of a Parisian company called the "Hôtellerie Parisienne." Inspired by the architectural designs of Georges-Eugène Haussmann, the hoteliers erected the hotel with a beautiful cut-stone façade, continuous balconies, and an iconic mansard roof. Since its debut as the “Hotel Windsor” in 1907, the business has continuously maintained a strong reputation for its timeless grandeur and luxurious style. AccorHotels now owns this historical building, having operated it as the marvelous Sofitel Paris Arc de Triomphe over last three decades. The Sofitel Paris Arc de Triomphe has been among the most distinguished hotels in the French Capital for more than a century. With 124 distinct accommodations from which to choose, guests are certain to adore its wide selection of available guestrooms and suites. The Hotel’s bistro-style restaurant, Les Cocottes Arc de Triomphe, by renowned Chef Christian Constant, is one of the premier destinations in Paris to feast upon classical French cooking. The Sofitel Paris Arc de Triomphe also features five meeting venues that are terrific for hosting any kind of large celebration. 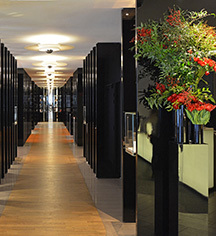 The Sofitel Paris Arc de Triomphe is surrounded by incredible cultural institutions. The city’s magnificent UNESCO World Heritage Site is located nearby the Champs Elysées Avenue, granting for guests a wonderful opportunity to witness the best of Parisian culture. An abundance of French landmarks, like the Arc de Triomphe, and famous museums are a short walk away from the hotel. 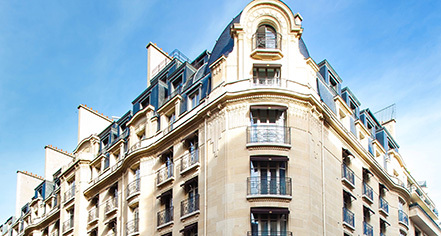 Sofitel Paris Arc de Triomphe, a member of Historic Hotels Worldwide since 2018, dates back to 1907. In 1978, the first tests of the phone smart card with an integrated circuit, invented by Roland Moreno, were conducted in this hotel. Cancellation Policy: Cancellations must be made 24 hours prior to arrival. The building that now constitutes the Sofitel Paris Arc de Triomphe was originally the creation of a Parisian company called the "Hôtellerie Parisienne." Inspired by the architectural designs of Georges-Eugène Haussmann, the hoteliers erected the hotel with a beautiful cut-stone façade, continuous balconies, and an iconic mansard roof. Learn more about the History of Sofitel Paris Arc de Triomphe .